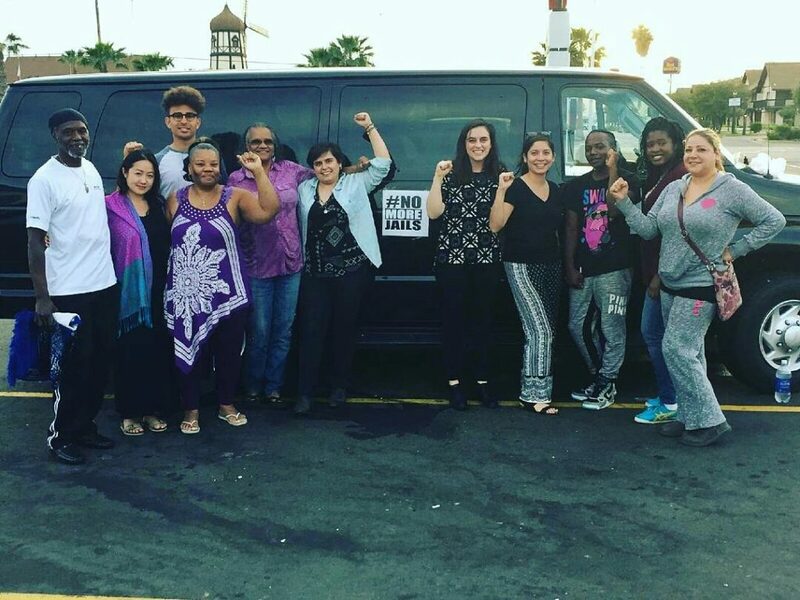 Caravan of community members traveling from Los Angeles to Sacramento in support of Prop 47. As state budget negotiations approach the June 15 deadline, community groups across California are mobilizing to make their voices heard. On Thursday, April 7, SCOPE members Taqwa Bowie, Carolyn Riley, Deborah Holt Bell, and I accompanied Californians United for a Responsible Budget (CURB) to Sacramento to participate in a lobby day and hearing for Budget Subcommittee 5 on Corrections, Public Safety and the Judiciary. Our priority on the agenda was Proposition 47, the criminal sentence reform ballot initiative from 2014 intended to reduce incarceration and move money out of the prison system and into preventative services. Prop 47 supporters were livid when the Governor’s initial budget proposal was first made public in January. Previous calculations by the nonpartisan Legislative Analyst’s Office (LAO) anticipated savings from Prop 47 in the ballpark of $150 million; however the Department of Finance (DOF) instead proposed a savings-related budget allocation of only $29 million. What happened? This discrepancy led Senators and Budget Subcommittee members Loni Hancock (SD 09), Joel Anderson (SD38), and Jim Beall (SD15), joined by Senator Mark Leno (SD11) and representatives from the DOF and LAO to explore the $120 million gap in Prop 47-related savings. 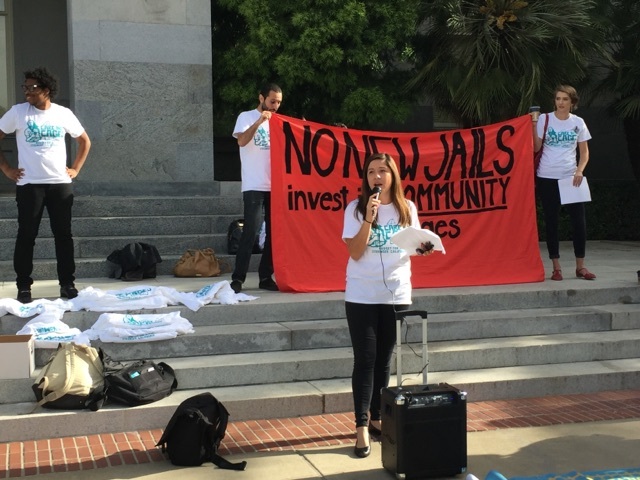 How much does California spend to incarcerate individuals? In order to understand the savings calculations, it’s necessary to know how much the state spends to incarcerate individuals. By the ordinance definition, Prop 47 savings are calculated by the number of prison beds reduced (how many inmates released), multiplied by the cost per bed. In California, most individuals incarcerated by the state are housed in state prisons; however in order to comply with a 2013 federal court mandate to reduce prison overcrowding, the state contracts beds in alternative facilities in and out of state to accommodate our prison population. These expensive “contract beds” cost the state around $26,000 per person, a rate that the DOF and LAO both signed off on for the purpose of estimating savings from reduced incarceration. It’s this cost per bed estimate that is the point of contention—the Department of Finance used the significantly lower estimate of $9,300, or the cost of housing an individual in a state prison, for a significant percentage of the beds in their budget calculation. According to the DOF, not all of the individuals released from Prop 47 accounted for a “contract bed”. Thus using both rates, and some acrobatic arithmetic, the DOF arrived at a blended per-bed rate of $11,000, multiplied by the 4,700 Prop 47 releases to arrive at a gross savings of $52 million, from which the net $29 million in savings was calculated. Exactly how the “blended rate” was determined was unclear. 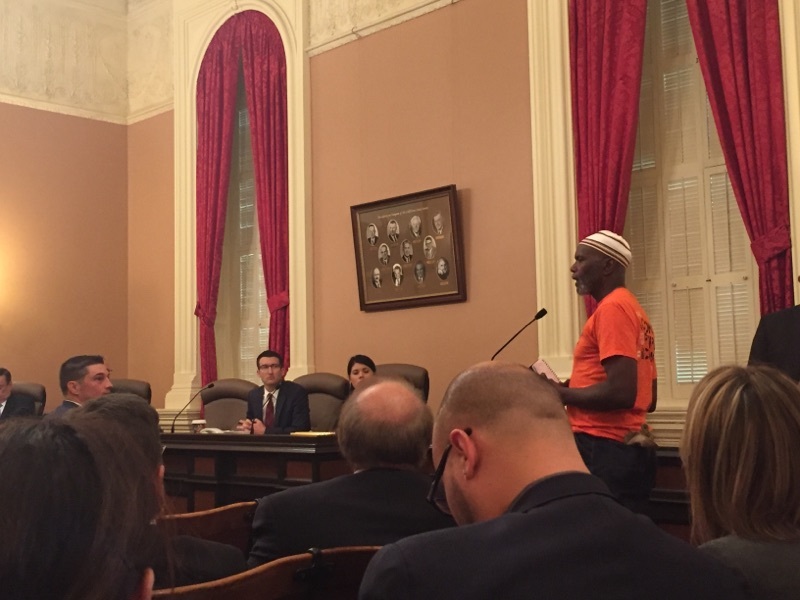 SCOPE Grassroots Member, Taqwa Bowie, speaking at the Budget Subcommittee in Sacramento. Participants of the CURB lobby day flooded the hall and the chamber reached capacity, so not everyone was able to sit in on the entire meeting. I made it into the chamber as the DOF was beginning its presentation. The DOF’s underlying rationale for reducing the funds allocated struck a chord. It was the similar story of fiscal conservatism; that saving state money in the short term is our highest calling. And the administrative costs of changing legal records, the increased costs of parole and probation all chipped away from the net savings estimate on top of the per-bed rate change. But is austerity really the approach across the board? Governor Brown has proposed $250 million in awards for new prison construction, when the electorate had just indicated a preference moving in a different direction. What is the prevailing philosophy here? Selective austerity? Why are mental health, substance addiction treatment, youth development, and victim services all areas where we can afford to cut corners, but jail construction remains a funded priority? And how sound is the assumption that deferring serious investment in public health services that can divert Californians from incarceration saves money in the long run? I’m not sure I buy it. The root problem isn’t that we need more county jail space. And shame on us if that’s our plan for dealing with prison overcrowding. It’s never been that we don’t have enough space. The root problem is that we have too many people going into the system. Mathematic obscurities and political perspective aside, the DOF’s analysis raised a question of consistency. Not only had the DOF already signed off on the $26,000 contract bed rate in January 2014, it turned out that the state of California is still using the contract bed rate for other criminal justice policy implementation. Senator Leno pushed a line of questioning to establish that there was no programmatic change to curtail use of the contract bed rate. So the discrepancy for Prop 47 calculations seems unfounded. Senator Beall captured the sentiment of the room, noting that there is a clear policy precedent that is consistent with and complimentary to Prop 47. However, those state senators don’t have the authority to ensure the appropriate calculation makes it to the budget. Legislators have the authority to ask the Legislative Analyst’s Office and the Department of Finance to sit down and come to an agreement (again). Ultimately the Department of Finance will decide. That’s why dozens of activists from across California took days off of work to make our voices heard. We certainly have the power to influence a final decision, because our voices too often contain the most important experiential information otherwise absent from the process. As a voter who helped approve the ballot initiative in 2014, I’m exhausted to realize that thorough implementation takes so much public pressure. It’s not enough for voters to win change at the ballot box when there are other mechanisms that help the system stay its course. We have to be involved in continuing to pressure decision makers to uphold the existing agreement and fully fund Prop 47 implementation. If we don’t, the people who need those public health services will pay the cost. CURB members speaking at a rally held in Sacramento in support of Prop 47. Does Prop 47 Do Enough? One CURB activist who I joined to meet with State Assembly Members brought yet a deeper analysis. She shared the story of her husband, serving a 10-year sentence for a violent offense, who found himself a bottom priority for programs and services on the inside. “Where is the relief for violent offenders?” she asked. How can we pretend that rehabilitation and reentry can be possible if support systems exclude populations across the board? How does warehousing inmates lead to transformation? The tough on crime philosophy that skyrocketed prison populations has impacted more than just lower-level, nonviolent offenders. But what we mainly see are iterations of similarly tailored policies; in sentencing reform in New Jersey and in presidential pardons of drug offenders. They’re among the most politically viable criminal justice reform policies in consideration today. But they leave me with questions. Has Prop 47 done enough? Are people satisfied with the California criminal justice system today? Will we reach satisfaction once Prop 47 has been rolled out to it’s fullest potential? We still have tough on crime D.A.’s, tough on crime Sheriffs’ Departments, tough on crime elected officials, and tough on crime individuals and communities throughout California. Many people believe that crime is more a result of moral depravity than socioeconomic conditions. Many people think that accelerating and exaggerating criminal punishments really work as long-term strategies to deter crime, as opposed to investing in jobs, communities, and public health. And we’re still having conversations about building more jails! I think now more than ever it’s clear that we need full, faithful implementation of Prop 47. We also need to talk about who has been left out, and find ways to change the system to transform lives. We need to talk about other sentence reforms. We need to talk about programs and services for folks on the inside. We need to talk about reentry infrastructure, with emphasis on access to employment for the formerly incarcerated. And we need to build power to win on those and other fronts. I hope you as a reader are on board there as well. We have much work left to do. This post was written by SCOPE Organizer Benjamin Toney.